10% of sales proceeds goes to help homeless pets! Look what a lovely person you are! **Gift recipient's email is required for gift messages. Please see important information about gift messages, below. Everybody knows that shelter cats are the coolest. But here, captured for the first time, are shelter cats living their best life! OK, maybe not their best life, but, y'know...talking about music and romance and snacks & stuff. They're cute. They're funny. Just...look at the calendar and you'll get it. 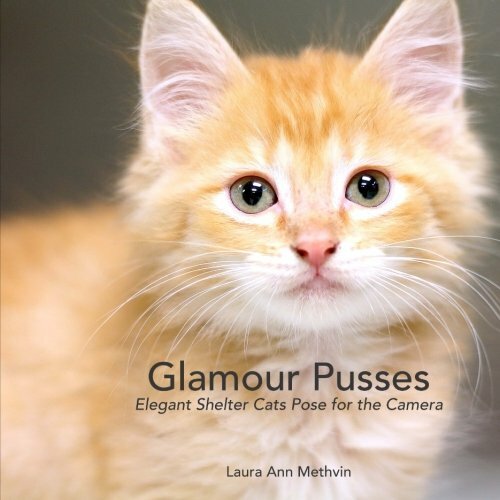 8.5 x 11" wall calendar featuring 12 monthly photos of cats and kittens from the Glamour Pusses collection. The gift message will be emailed on the day of scheduled delivery. It's a really nice email! They'll love it! If you want to send a calendar to someone without a gift message, that's totally cool. Just skip the gift message & recipient's email boxes in your order. But DO remember to provide the gift recipient's shipping address, of course. Receipts are not included in any calendar shipments, whether gifts or non-gifts. PayPal issues the receipts via email. Questions about your order? Just send me an email.